Why should you care about the functions of vitamin C? Because they explain the symptoms of vitamin C deficiency. While it is rare in the United States, vitamin C deficiency, known as scurvy, displays symptoms that are a result of weak collagen, that in turn, weakens connective tissue throughout the body. Symptoms of scurvy include bleeding gums, pinpoint hemorrhages, and corkscrew hairs as shown in the figure and link below. Additional symptoms include impaired wound and fracture healing, easy bruising, and loose or decaying teeth. Scurvy can be fatal if not treated. Scurvy was the first discovered nutrition deficiency in 1746 by James Lind, who is shown below. Keep in mind as you read the description below that suggesting scurvy was due to a diet deficiency, at that time, sounded like flu was caused by not consuming green beans. Sounds pretty crazy, right? Lind was a surgeon on a British navy ship. Frequently during voyages, the sailors would develop scurvy for reasons that weren't understood at the time. It was known that citrus fruits could cure or prevent scurvy, but it was believed this was due to their acidity. 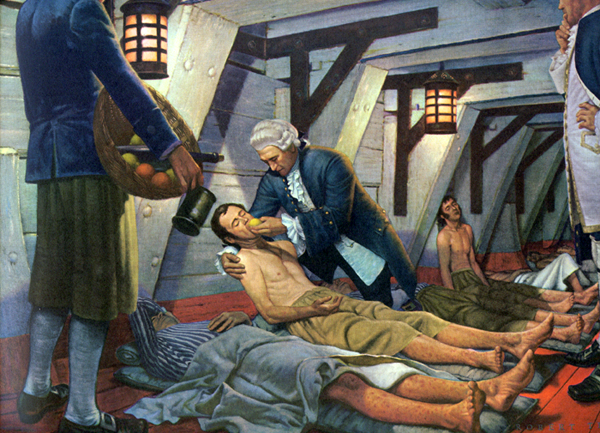 Lind performed clinical trials comparing citrus juice to dilute sulfuric acid and vinegar and found that only citrus juice caused the sailors to recover, as depicted in the link below. As a result of the discovery, the British sailors became known as "Limeys" because they would drink lime juice to prevent the development of the disease4. Carpenter K. (2003) A short history of nutritional science: Part 3 (1912-1944). J Nutr 133(10): 638-645.